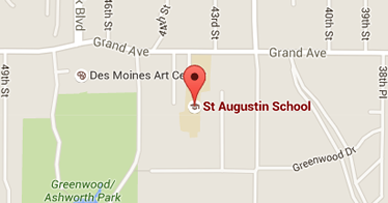 Learn More About St. Augustin Catholic School! Founded as an Iowa Catholic school in 1926, St. Augustin provides a quality Catholic education for young children, preschool through eighth grade. Our students learn in an environment that nurtures spiritual, intellectual, social, and personal growth. As a Des Moines Catholic school and a proud member of the Diocese of Des Moines, we have a commitment to sharing the teachings of the Gospels. We encourage students to embrace these teachings in all that they do. A dedicated and highly qualified faculty and staff, in collaboration and cooperation with supportive and caring parents, share the responsibility of helping St. Augustin students recognize their own personal worth and encourage them to set and achieve high standards and goals. With the help of Des Moines Catholic schools, your child can exceed expectations. St. Augustin Catholic School was named a National Blue Ribbon School by the United States Department of Education in 2004. This prestigious award represents academic excellence, intellectual vigor, and educational accountability. The Blue Ribbon Schools program recognizes the commitment of faculty, staff, and parents. It is our mission at St. Augustin Catholic School to provide meaningful educational experiences for our students in an environment inspired by Gospel values, which nurtures faith, community, prayer, and service. Teach the traditions and doctrines of the Catholic Church and to live the Gospel message of Jesus Christ. Partner with parents to encourage both intellectual and spiritual growth. Nurture each student -- regardless of race, cultural heritage, or gender -- to grow in self-esteem through the development of his/her talents, skills, and interests. Provide a warm, caring environment where students will be challenged to learn the essential curriculum. Learn the value of human dignity and the concepts of peace and justice to enable students to be involved participants in a global society.